www.kochfoods.comAn Antioch Farms product -- raw stuffed chicken breast breaded, boneless breast of chicken with rib meat a la Kiev -- was linked to salmonella. A recall of chicken contaminated with salmonella that at first appeared to be limited to Minnesota has been expanded to 16 states, according to the U.S. Department of Agriculture. The initial recall notice issued last week only mentioned that the products had been shipped to distribution centers and retailers in Minnesota. But a list of retailers that sold the chicken --including Albertsons and Shaw's -- includes stores in 16 states. Aspen Foods, a division of Koch Meats in Chicago, announced the recall at the request of the USDA's Food Safety and Inspection Service after Minnesota health officials and the U.S. Centers for Disease Control and Prevention identified a cluster of salmonella cases that appeared to be connected to Antioch Farms prepackaged chicken Kiev. In addition to Minnesota, the chicken was sold in Colorado, Idaho, Illinois, Massachusetts, Maine, Michigan, Montana, North Dakota, New Hampshire, Nevada, Rhode Island, Vermont, Utah, Wisconsin and Wyoming. The recall involves 28,980 pounds of chicken products with sell-by dates of Oct. 1, 2015 and Oct. 7, 2015. Each package should have a USDA inspection mark with the facility number "P-1358" inside. 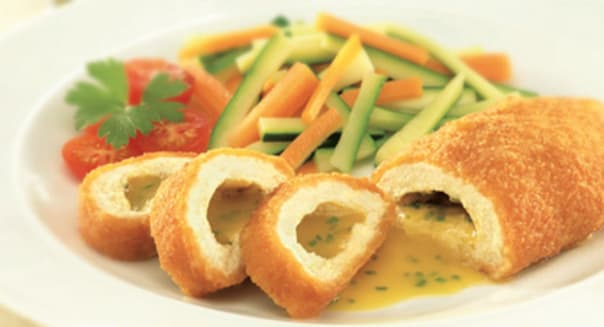 The product identified by health officials as having caused the illnesses is "raw stuffed chicken breast breaded, boneless breast of chicken with rib meat a la Kiev." The first cases of salmonella were brought to the USDA's attention earlier this month. At least six people have had confirmed cases, with one hospitalized, the USDA said. An investigation tied the illnesses back to the facility where the chicken was produced. Consumption of food contaminated with salmonella can cause salmonellosis, the USDA says. The most common symptoms are diarrhea, abdominal cramps and fever within 12 to 72 hours after eating the contaminated product. The illness usually lasts four to seven days, and most people recover without treatment. Older adults, infants and people with weakened immune systems are more likely to develop a severe illness.